Hala China, a joint initiative by Meraas and Dubai Holding, will bring a variety of Chinese experiences to Dubai for a month of celebrations to usher in the new Chinese year that begins on February 5 this year. Some of Dubai’s most vibrant destinations, including Al Seef, Bluewaters, Boxpark, City Walk, Dubai Parks and Resorts, Jumeirah Beach Residence (JBR), La Mer, Madinat Jumeirah, The Beach, Global Village and The Outlet Village, will be decorated for the occasion from January 28 to February 23 to host a packed schedule of activities as the city continues to embrace Chinese culture. Sheikh Majid Al Mualla, chairman of the board of directors at Hala China, said: “Hosting the biggest Chinese New Year celebrations outside China in Dubai this year allows us to further contribute to realising the pioneering tourism vision of His Highness Sheikh Mohammed bin Rashid Al Maktoum, Vice President and Prime Minister of the UAE and Ruler of Dubai, and to diversify the emirate’s economic landscape." “Given the range of Chinese-inspired events and activities we are set to witness across some of Dubai’s most innovative destinations, we are confident that the Chinese diaspora and tourists will enjoy the month-long festivities. The celebrations will demonstrate why the city’s state-of-the-art infrastructure and inclusive culture make it an ideal home for Chinese expatriates,” he said. Tan Li, acting consul-general of the People’s Republic of China in Dubai, said: “The extensive list of Chinese cultural activities that Hala China will host in Dubai over the next month is a shining example of the mutual respect and progressive vision China and the UAE share, and their proactive contribution to each other’s cultural awareness and social integration." “For the people of China, Chinese New Year is a time of great hope for the future and reflection on the past. The fact that Dubai is embracing our cultural heritage in such a generous, open and welcoming way speaks of the strengthening social ties between China and the UAE,” she said. Distinguished members of the UAE royal family, UAE government ministers and leading diplomats from the Consulate-General of the People’s Republic of China in Dubai will attend a glamorous gala event at the Bvlgari Resort Dubai to launch the Chinese New Year festivities. The dignitaries in attendance will break bread over a lavish Chinese menu, complete with a tea ceremony and exquisite food carvings, created by a leading Chinese food culture exhibition group. The expected presence of a roster of VIP celebrities from the UAE and China at the official opening of the Dubai-hosted Chinese New Year celebrations testifies to the importance of the Hala China initiative in advancing bilateral synergies. One of the highlights of the festivities will be the multi-faceted Food Festival. To start with, the Exchange Programme – taking place on January 27 at The Emirates Academy of Hospitality Management – will have the students of the academy learn how to cook authentic Chinese and Arabic food from a well-known Dubai-based chef. The exchange will bring the best of both cuisines to life on the plate. On January 29, Hala China is set to run a TV cooking competition that will see 10 top master chefs from China and 10 revered UAE-based chefs go head-to-head at Nikki Beach in front of a live audience, with Dubai’s restaurateurs and foodie influencers judging the outcome of the cook-off. The chefs, split into five teams of two, will have just 20 minutes to whip up an appetizer, a soup, a main course with meat, a vegetarian main course and a dessert. From January 28 to February 1, surprise performances inspired by Chinese traditions will unfold in the lively public spaces of Al Seef, Bluewaters, Boxpark, City Walk, Dubai Parks and Resorts, JBR, La Mer, Madinat Jumeirah, The Beach, Global Village and The Outlet Village. 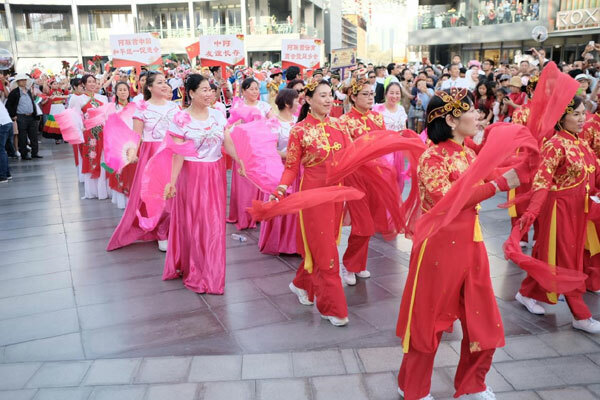 Among the performances will be demonstrations of the Chinese martial art kung fu, fashion shows presenting traditional Chinese garments qipao and hanfu, classic Chinese dances such as the Snow Lion, and children’s street dance. On February 1, Dubai’s vibrant streets will set the stage for the spectacular Grand Parade, starring enormous dragons, acrobatic performers and much more. Al Mustaqbal Street at City Walk has been designated to host the parade of over 40,000 participants that is certain to generate a roar of approval from the audience. From February 1 to 9, Dubai Parks and Resorts will host a sprawling Chinese Market featuring merchant exhibitions, Chinese craftsmanship displays, opera performances and Chinese art stalls. From February 7 through to the end of the festival on February 23, up to 30 stands will assemble along the streets of Al Seef for the Food Market that is set to offer visitors the chance to sample all things deliciously Chinese, from spring rolls to dumplings and wontons, as well as favourites from the region.